Will most likely be picking up a new DH bike for 2015 and its been quite a few years since I've been in the DH game. I can get a nice deal on a 2015 Glory 0 but have some questions regarding the specs. Where I'll do most of my DH riding is anything but buff. It is old-school, natural featured, super chunky riding, that can really put a pounding on a bike. DH X01 - the top end Glory comes spec'd with the DH X01 drive train. There are very few reviews on this out there but from what I hear it works well. Not sure about durability. My biggest concern is that should I whack and need to replace the RD, looks like it will cost some big bucks. Compared to the lower level models with Shimano Zee parts, replacement costs and availability could be a big issue. For example, if I take a trip with the bike and kill a RD, how likely is it the bike shop will keep an X01 in stock, ready to go. The Shimano (both Saint and Zee) can be easily found anywhere. The cranks are carbon. Years back that would have been a no-no on a DH bike. Wheels - The top Glory comes with a DT Swiss wheelset. Hubs look nice, but the rims do not look burly at all. They are the 471. Are these rims up for real DH abuse? Brakes - Guides. I'm willing to take my chances even though I'm a Shimano fan. The Glory has 3 models. The lowest model is out for me due to the dampers. The mid-level vs the top is what I'm looking at. The mid-level comes with Zee stuff and Giant's own wheelset. However, not sure if the mid-level model will even be available for me. Its not even listed on Giant's web site. Another option is for me to go with the frame only and build it up how I like with parts, which I can get at close to cost. Would most likely build up with a full Saint group and burlier wheelset. I am just in the same situation. At the moment, AFAIK, there is no cheap alternative for X01 DH RD. I've been thinking about making some RD guard to make the RD last longer. Similar to carbon fin guard on some Lapierre bikes. Don't worry about rims. Aaron Gwin rode half or more of the WC track w/o tire on one of them He didn't kill it. 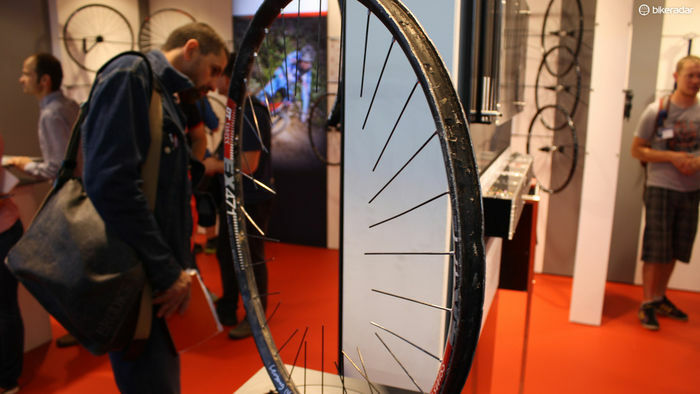 You could see this shreaded rim on DT booth at Eurobike. I will post a pic, once I DL from my camera. I been building my bikes for several years. Coz I wanted "nearly-dream" parts on them But, new Glory 0 is close to perfection, IMO I will just put air spring on Boxxer, Vivid Air on the rear, Havoc 750 carbon bar, and maybe XT brakes. Everything else suited me very well. i don't know about availabilty but none of the shops around here stock downhill specific parts like zee, saint, or x01. The big resorts will probably stock them but I'm sure they will cost a pretty penny. Thanks for all the good advice. Parallels what my experienced DH friend says. Also, I'm hearing if you can get the xo1 spec at a good price, don't pass it. The spec'd rims are a puzzle. But, would likely ride'm till they die and build up the nice hubs. It looks like you are wanting to change expensive parts, and if you can build close to what you can buy off the floor for? I would build all day long. You get everything you want, nothing you don't. Want a one of a kind bike? Message me for a one of a kind paint job.